Maritigrella virgulata is an unsegmented worm belonging to the phylum platyhelminthes. They are free living marine animals. It has a leaf shaped body with highly ruffle edges. Since they are so thin, they are able to rapidly diffuse oxygen into their bodies. Their digestive system is branched, so nutrients are quickly absorbed. 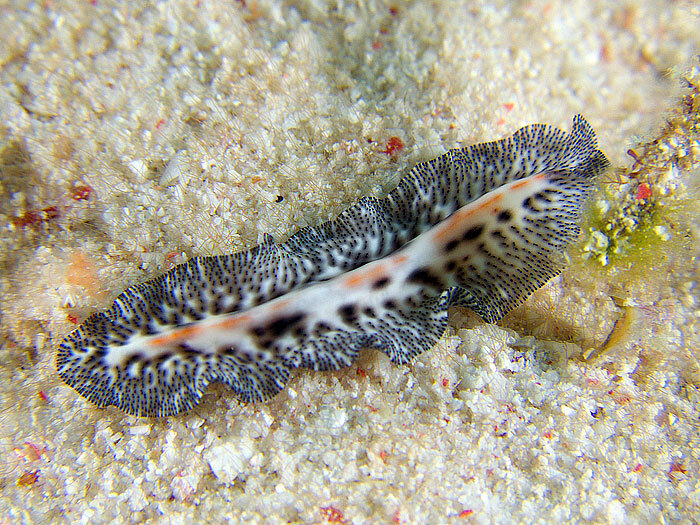 In order to ingest food, the flatworm must push their pharynx out through their mouth and engulf prey much like echinoderms. Their prey usually consists of protozoans, worms and copepods as well as bivalves. Flatworms are hermaphrodites. Maritigrella vigulata can be found in the subtropical waters of the coasts of Singapore. It prefers to stay near the ocean floor amongst sediments. Maritigrella vigulata has no known importance to humans.